That's always been one of my favorite Disney songs, so it was extra special that Angie Tefteller picked it as the theme of a July fundraiser to benefit INAD research. Angie and her family have a metal sign business called DTA Metals, and I first did a story about them for the paper several years ago. Grace was a baby, and they cut a sign with her name using baby blocks. It was just darling. Check out the beautiful stars we made! Fast forward a few years later, and Angie has been one of our biggest supporters for funding the research project. She and her son Dalton, are even going to participate in the Grace-Filled 5K on Sept. 5. Angie called me earlier this summer to tell me she had branched out with her business for home-based parties where participants could paint their own signs, and that it was turning out to be a lot of fun. One of her favorite aspects was that it had become a "girls night out" of sorts for her too! Grace supervises our work . . .
She asked me if she could do a party as a fundraiser for Grace at Forsee Winery in Coffeen, as they had graciously agreed to let us use their facility. I was thrilled. What a fun way to raise money for a great cause! I was even more excited when she released the theme, "Making a Wish Upon a Star to Cure INAD." And everyone got to paint a metal star to take home. Grace snuggling with Grandma Susie! As it turns out, the fundraiser was the same night as one of my monthly assignments, the Litchfield School Board meeting, but Kyle offered to attend, so I could go to the fundraiser, and I really appreciated it. I asked mom is she would come too, and we had a great "girls night out." We got to the winery, and everything was set up and ready to go. Mom and I are not always the most creative, so we stuck to patriotic red, white and blue, and really had a good time painting our stars. It was fun to visit with others that night, and Grace was so patient the whole time. I even painted a smiley face on her hand. Grace really liked her smiley face! 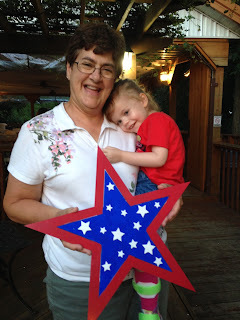 While mom and I painted stars, Angie had a special butterfly that her assistant painted purple and green for Grace. Dalton's favorite color is green, and he likes that Grace likes green too. We can't wait to hang it up in her room. We can't wait to hang Grace's new butterfly up in her room! Although we might never have wished for this journey, so many in the community continue to make our dreams come true helping us to fundraise for research. We love you all!